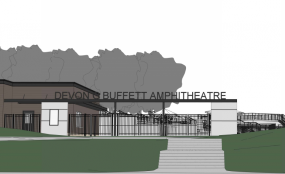 February 8, 2019 – A partial schedule has been announced for the newly named Devon G Buffett Lakeshore Amphitheater. The $4.25 million amphitheater funded by the Howard G Buffett Foundation is named in honor of Buffetts wife. The venue is planned to open Memorial Day weekend with show details still being confirmed. The preview of the 2019 season line-up include a variety of national touring, cover, tribute and regional acts. Mike Wilcott, amphitheater General Manager says this venue will improve the quality of life for those in Decatur and Central Illinois. 5/26 – Forever Motown, A Tribute to the Music of Motown national touring act, played to sold out crowds across the country. 5/31 -A Tribute to Crosby, Stills, Nash and Young (based out of St. Louis, MO) recreates the iconic sounds of one of the late 1960s and 1970s super groups. 6/7 -Wedding Banned (based out of Chicago, IL) this group is a fan favorite wherever they play and was recently voted #1 wedding band by CBS Chicago. They play a mix of popular songs from 80’s, 90’s and today. 6/21- Heartache Tonight, A Tribute to the Eagles this national touring group has been recreating the Eagles’ show for fans of all ages for over 15 years. 7/4- Red Carpet Riot brand new band based out of Chicago featuring performers from the Broadway hit Million Dollar Quartet. This group cranks out the music of Michael Jackson, Lady Gaga, Guns N’ Roses, Bruno Mars, Whitney Houston and more. 7/12- Lick Creek Central Illinois’ top country band that specializes in covers while also performing a handful of original songs. They’ve been voted the best band by The Illinois Times Readers’ Choice 2015 – 2018. 7/26- The Breakfast Club Chicago based group playing all fan favorites from the 1980s while also wearing outfits fitting of the era. 8/10 – Chicago 6 This group featured three members of the 1985 Super Bowl Champion Chicago Bears; Dan Hampton, Steve McMichael and Otis Wilson along with three other talented musicians to play popular songs of the 1960s, 1970s and more. In honor of the Bear’s 100th season and their Decatur Roots, this show is the perfect way to kick off the football season. 8/23 – Hello Weekend This Chicago based group brings the party to a whole new level while performing hits from Pit Bull, Sia, Katy Perry, Taylor Swift and all your favorite current radio hits. 9/13 – No Alternative based out of Chicago this band pleases crowds with spot on performances of rock and pop hits from the 90s and early 2000s. 9/20 – Comedians Brad Upton and Troy Davis Brad went viral last year with some of his stand up clips from Dry Bar Comedy on multiple social media platforms. He has spent most of his career performing in the Pacific Northwest while raising his kids and being a 4th grade teacher. This clean comedian, has performed over 3400 shows in his career. Troy Davis is an Indiana native that has spent over 15 years touring comedy clubs all across the Midwest. His approach to real life situations from a different perspective provide plenty of laughs. The venue will also feature performances by the Decatur Municipal Band.